Calling all artists! 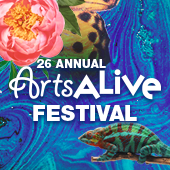 We are now taking bookings for vendor spaces for Arts Alive. With over 200 visual and performing artists, this "must attend festival" has become a signature event in the lower mainland. This free, family event features live musical performances, artists and artisans show casing a myriad of mediums, live demonstrations, a children's venue and special performance surprises all day long! Register today to avoid disappointment. Vendors please register today before this highly popular event is fully booked! Celebrating 26 Years of free non-stop family fun! Beautiful new work from the finest painters, potters, sculptors and jewellery designers. All-day musical performances in McBurney Plaza from BC's most talented musicians. Live music, fun activities & vendors. Enjoy local restaurants, food trucks or the stage side beer garden. FREE ALL DAY FUN FOR THE ENTIRE FAMILY!